Info "Choose the card with the highest value!" High Card Draw is one of Orbulon's microgames in WarioWare: Twisted! The game's purpose is to choose the card with the highest value. If done so, the game is won. However, if the player chooses the wrong card, they lose. 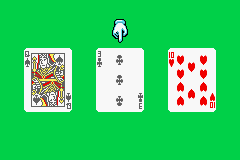 1st level difficulty: Three cards to choose from. 2nd level difficulty: Four cards to choose from. 3rd level difficulty: Four cards to choose from. However, they will be flipped from a time to another. This page was last edited on October 29, 2018, at 21:30.